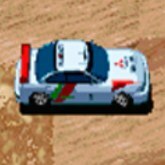 Description: Neo Drift Out is a fun arcade style rally racer that features a top down view. Play with 3 different Japanese rally cars including Mitsubishi Lancer, the Subaru Impreza, and the Toyota Celica. Try to make it to each check point before time runs out, to have your time renewed. If the time hits zero you will have to add more coins to play again. The beginners levels start off really easy but later levels have slippery roans, barrels and more stuff you have to dodge on the tracks.There is six stages to conquer from around the world including Europe, Africa, Snow Land, Southern Hemisphere, Scandinavia, and Great Britain.